Anyone who plays competitive tennis knows there’s nothing worse than breaking a string during the middle of a big point. Just ask Grigor Dimitrov, the tennis pro who stormed off the court and quit a championship final in 2016 after suffering a series of broken strings! Obviously when a string breaks during play, you’ll have to get the racquet restrung. But you shouldn’t necessarily wait until you have a broken string to restring your tennis racket. A racquet can long outlive its strings without ever breaking them. The result can be poor shot consistency or a decrease in power. To maximize your game, you’ll want to restring at the appropriate moments. Here’s a short guide to knowing when it’s time to have your racquet restrung. When your string breaks during a match, you’ll have no choice but to restring it (or to buy a brand new racket.) Whether the break happens due to a particularly hard shot or just lots of wear over time, this will be the most jarring reminder to take care of your equipment. If you’ve begun to notice a consistent difference in how your shots travel, the culprit might not be anything to do with your form. You may simply have a worn-through racquet. Most commonly, this will manifest in the form of overall weaker shots, or shots with a lower-than-normal arc. However, there may occasionally be other types of complications, so be sure to check out any irregularity for good measure. Sound may be a good indicator that your strings are losing strength. If you’re suddenly hearing unusual thuds or dull sounds when you swing, this could be a red flag. Check over multiple shot types and balls to be sure, and don’t rush to conclusions, since it can be easy to mistake normal sounds for impure ones. For the casual tennis players, a tennis racquet can last years, but if you play all the time, your strings might be worn out enough to require replacement after 6 to 12 months. This time frame varies depending on your style and frequency of play. 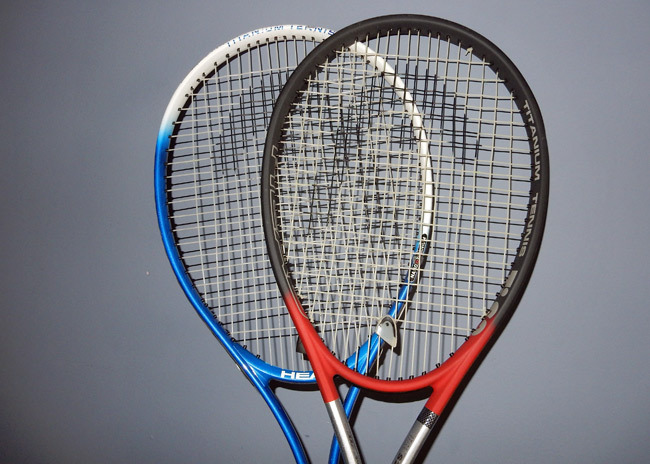 Your strings will obviously last longer if you’re a casual weekend doubles player than if you’re a laser-firing, hard-hitting tournament player. After playing with the same racquet and strings for a couple years, you should have a good idea of how long to go before restringing them. When it comes to the restringing process, you have two obvious options: Find someone to do it for you, or do it yourself. Outsourcing the process means taking the racket to a local tennis shop or sporting goods store. If you prefer the DIY option, you may want to buy a tennis racquet stringing machine. These can range from Gamma X-ELS machines that cost well over $1000 to the more affordable Klippermate, which retails for less than $200. Which machine you purchase will depend on your preference for brand, features, and ease of use, as well as your budget.